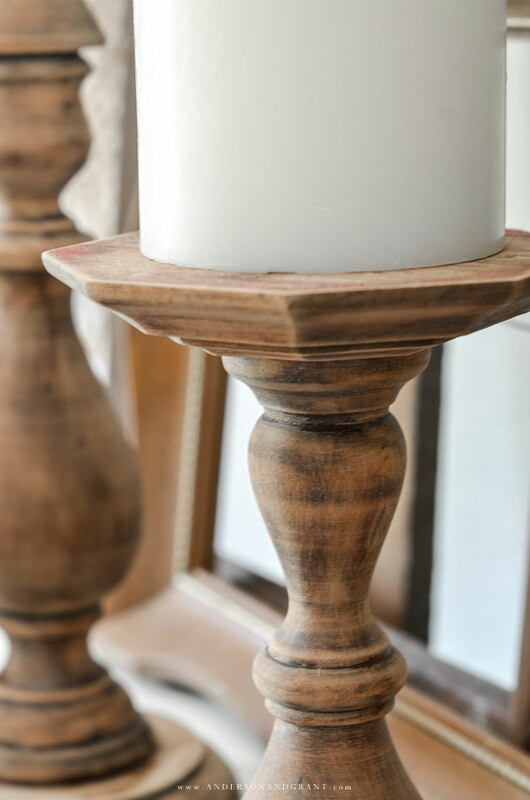 Learn to make rustic chunky wood candlesticks for practically nothing using candlesticks from the thrift store. 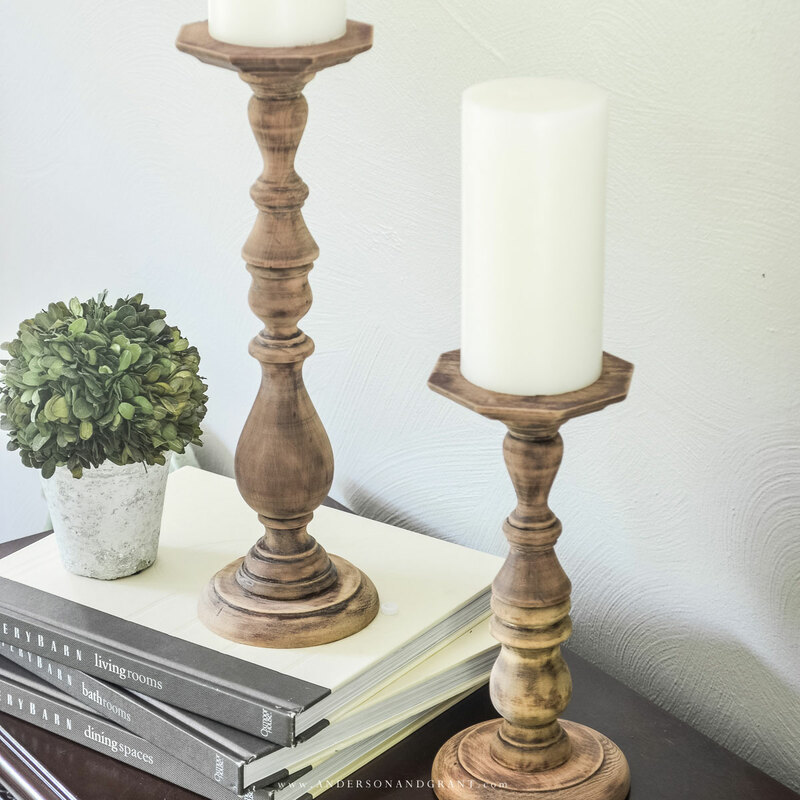 I've been seeing rustic wood candlesticks all over the place lately.....on blogs, in magazines, displayed on Fixer Upper.....and I knew they were something that I wanted to DIY. Some are tall. Some are chunky. Some are painted. Some are wood. But they all are fabulous! My original idea for making them did not work, but I kept trying and ended up with a project that is even better (and easier) that I had originally planned. 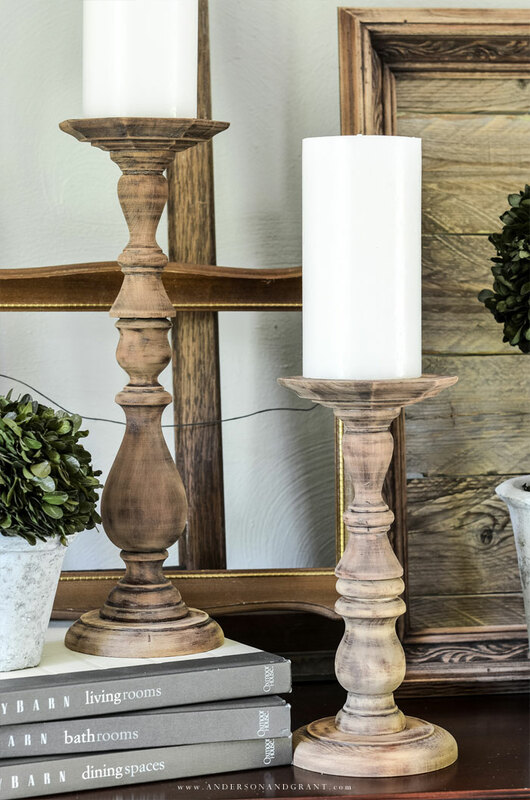 These dark stained candlesticks are readily available at thrift stores and antique shops. You can also find different styles on Ebay for not a lot of money. I've amassed quite a collection of them for craft projects over the years. They all have a nice shape, but I'm not too fond of the finish and some of them aren't in great condition as you can see. 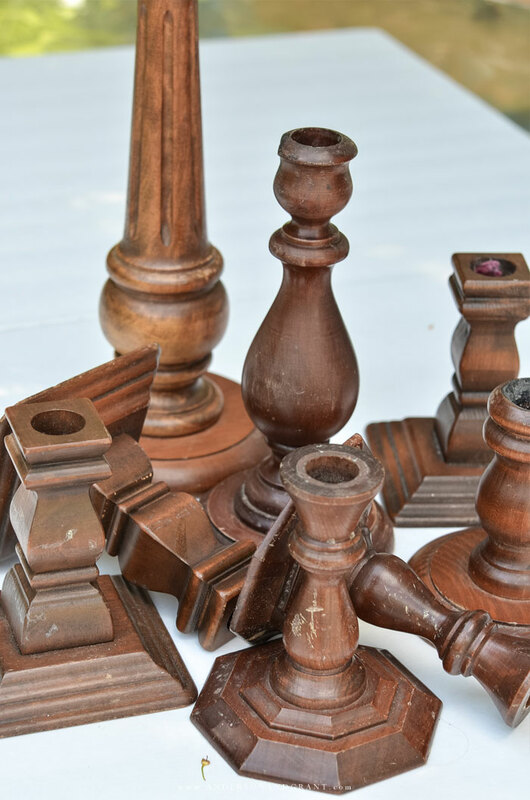 But after starting my "candlestick creating experiment," it dawned on me that much like furniture, the dark looking stain can just be sanded off leaving behind a beautiful rustic wood finish. It is a little messy and takes some time, but doesn't that bare wood look fantastic?!?! 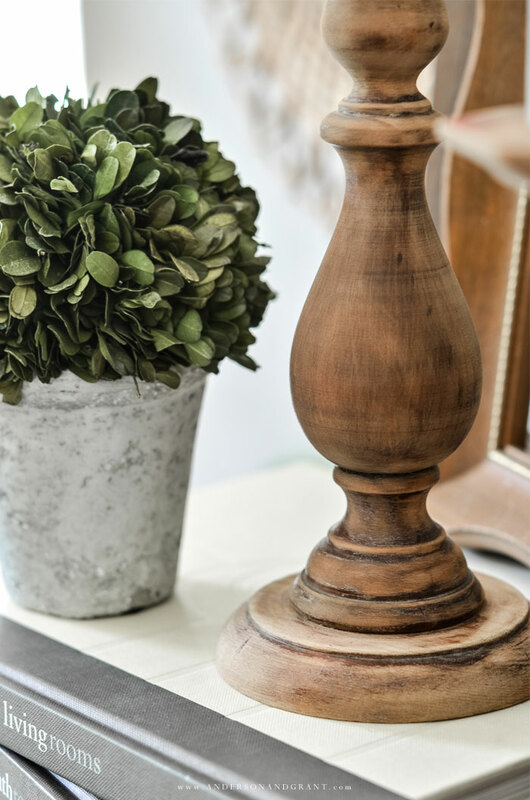 Maybe the rustic wood look isn't your style, but in that case, the candlesticks could be painted any color you'd like. Distress them or leave the painted finish untouched. 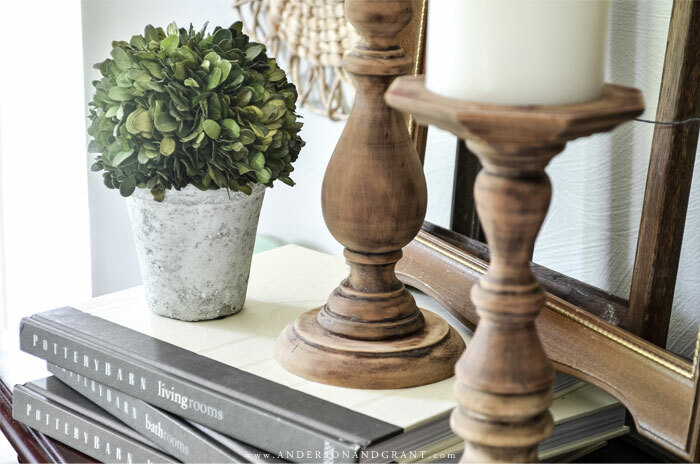 You could also coat the bare wood with hemp oil to really bring out the richness in the wood. 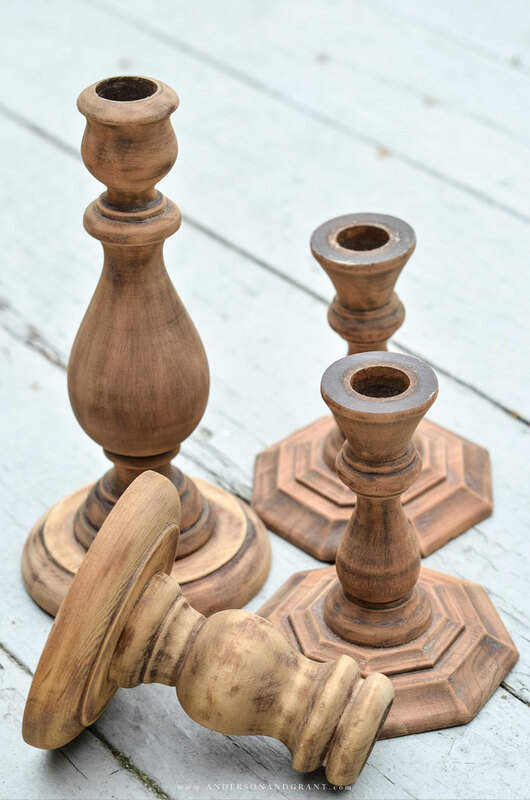 Begin the project by gently sanding away the stained finish on the thrift store candlesticks. Wipe them with a damp rag or paper towel to remove the residue. 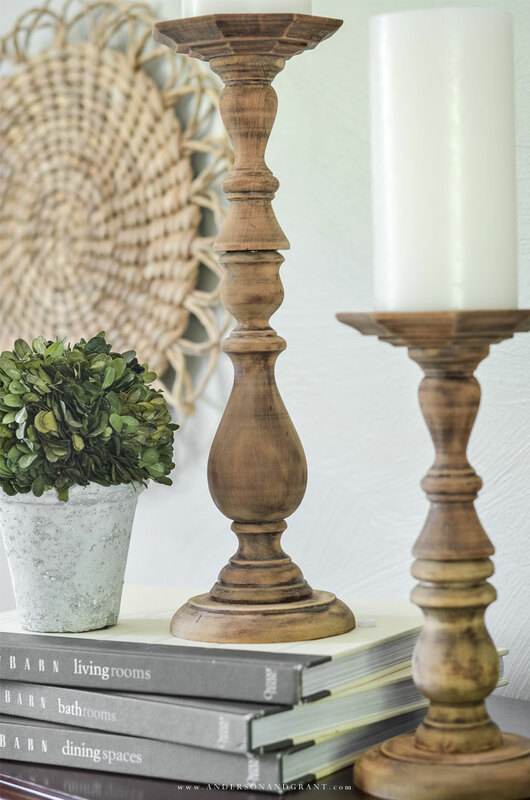 After removing the finish, the only other step to creating these super simple DIY candle sticks is to glue two of them together. For this set, I chose to glue the open ends of two candlesticks together to form a flat topped pillar candle holder. You can also glue the base of one candlestick on top of the open end of the other to create a taper candle holder. Want a really tall candlestick? Glue three of them together. You just need to make sure that what you glue together gives you a secure and stable connection. And you don't want to build anything that would be top-heavy and topple over. To make this pair of candle holders, I chose to use two matching candlesticks on the top with unmatched ones on the bottom of each. One of the base candlesticks was taller than the other, so it created a pair of candle holders that were two different heights. This gives the look that the candleholders were collected over time. Aside from the time it took to sand off the stained finish, this project was completed in just a few minutes. 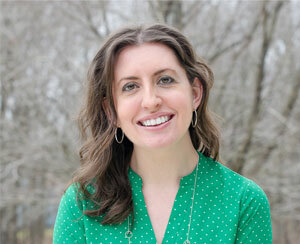 And I couldn't be more thrilled with the result. What do you think? Use left and right arrows to scroll through products.